Home » Tressa Lichtfuss, Au.D. Tressa Lichtfuss earned her Bachelors of Science in Speech Language Pathology and Audiology at Towson University in 2013. She returned to Towson University to obtain her Doctorate of Audiology (Au.D.) in 2017. Before she joined Fayetteville Otolaryngology in 2017, she completed her fourth year externship at Accent Physician Specialists in Gainesville, FL. She is a member of the American Speech-Language- Hearing Association and a fellow of the American Academy of Audiology. She is licensed as an audiologist in North Carolina. 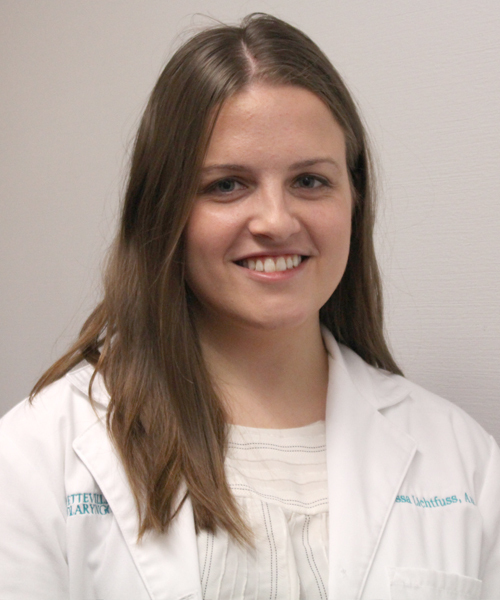 Her professional interests include diagnostics and aural rehabilitation for both adult and pediatric populations. In her spare time, she likes spending time outdoors and enjoys getting together with friends and family.